A stylish debut mystery with the perfect balance of sweetness and scares! Thirteen-year-old Bernie's summer is looking pretty grim. It's hard to make friends when your family runs a monument company, and your backyard is littered with tombstones. It's even harder when your mother suddenly refuses to leave her room . . .
To make matters worse, her father has just hired a new artist to engrave the headstones--the creepy Mr. Stein. Bernie has a bad feeling about him right from the start, and after snooping around his cottage, she discovers an engraved portrait of their neighbor . . . a woman who promptly dies the next day. And it's not just a weird coincidence. The pattern continues, and Bernie realizes that Mr. Stein has begun engraving headstones before people die, which forces Bernie to ask a horrifying question: Is Mr. Stein predicting the deaths . . . or causing them? 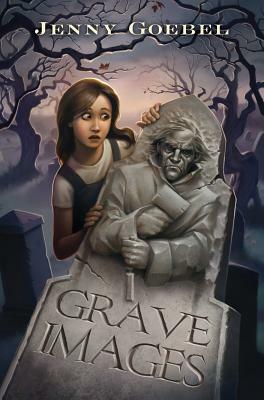 GRAVE IMAGES is Jenny Goebel's debut novel. She lives in Denver with her husband and three sons.